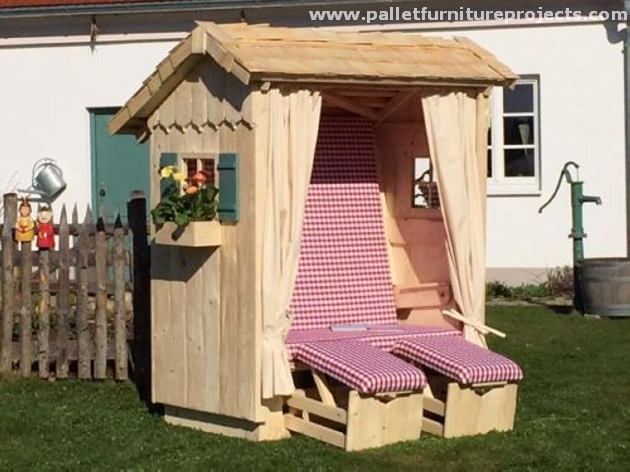 Where a lot of other furniture items have been recycled with wooden pallet, we just thought to introduce something new in the club of pallet recyclers who are always looking for some exciting plans. 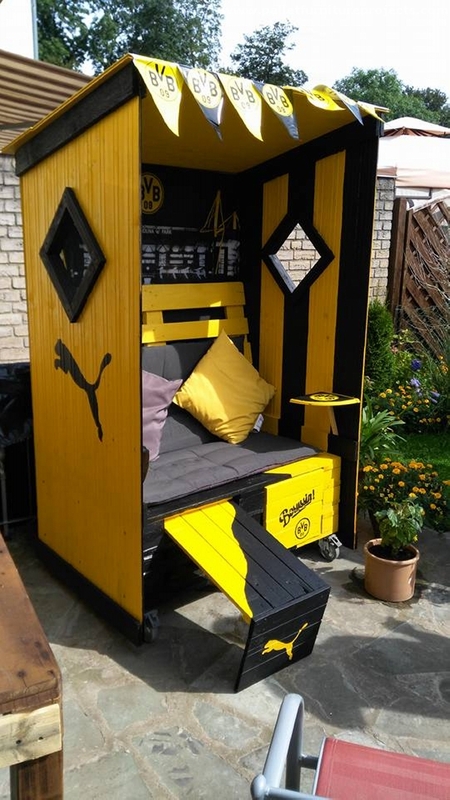 How many of you are familiar with a strandkorb? This literally means a beach basket or a beach chair. So if your house is somewhere around a beach then this chair or basket becomes a must have for you. 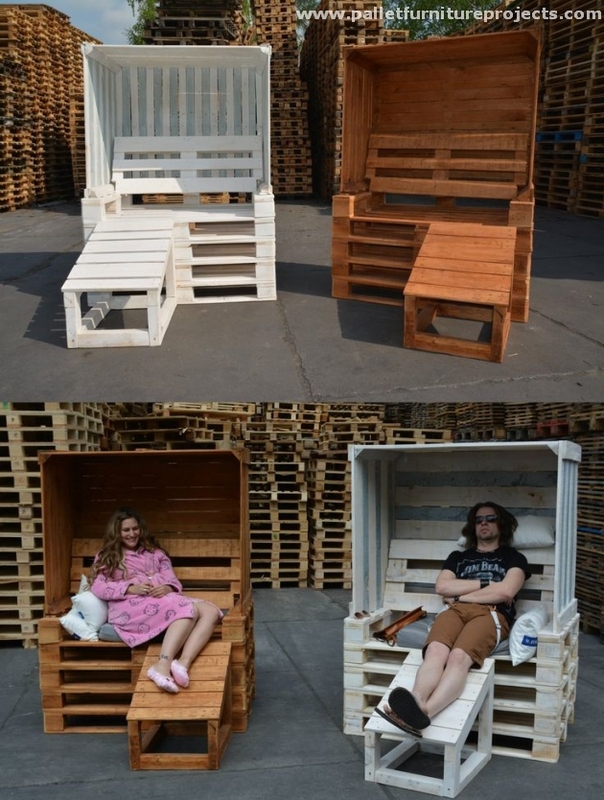 And having a wooden pallet strandkorb would be totally a new experience for you guys who love going on beach frequently and do some exciting activities there like swimming or surfing. Strandkorb is basically designed in such a manner that it prevents you from sun, wind, rain, and sand on beaches. So this becomes a pretty must have for all the beach lovers. And I am sure you wouldn’t have been through this pallet project earlier. This idea of strandkorb is quite dominant on coasts of North Sea and Baltic Sea. These coasts are famous for their strong winds. So these are frequently used on these coasts, they are not always owned by the surfers but these can also be rented from the strandkorb keepers. And when it comes to the shape or design of the strandkorb, this might carry two basic designs and they are the straight angular North sea variety and the round rolling Baltic sea variety. 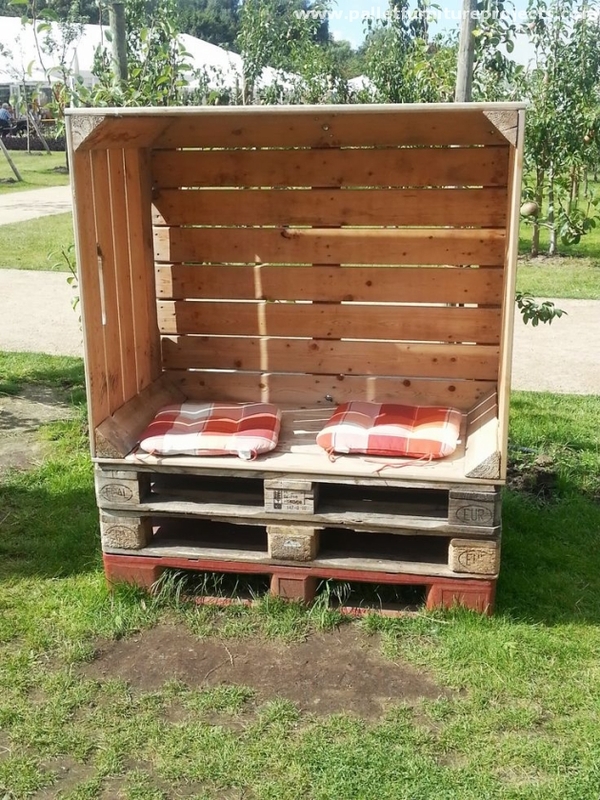 But you can certainly make some modifications when you are recycling it with wooden pallet at your own. Lets have a glimpse of the history of strandkorb. It was basically invented and introduced in 1882 for the first time by a German basket maker, and later on he realized that he has made a useful invention that would serve a large number of tourists who come to beach. So he started the first ever renting service of strandkorb. Initially it was one seater but with the passage of time there happened to be a lot of changes in the design and shape according to the desires of masses, people wanted to look it in the way they wanted. So I think a lot of research has been done on the basic structure and invention of the strandkorb. Now we must get towards the real job that we have intended for today. Just look at this hut shaped strandkorb recycled with wooden pallets. It just looks like a cabin house along with two easy and long chairs. 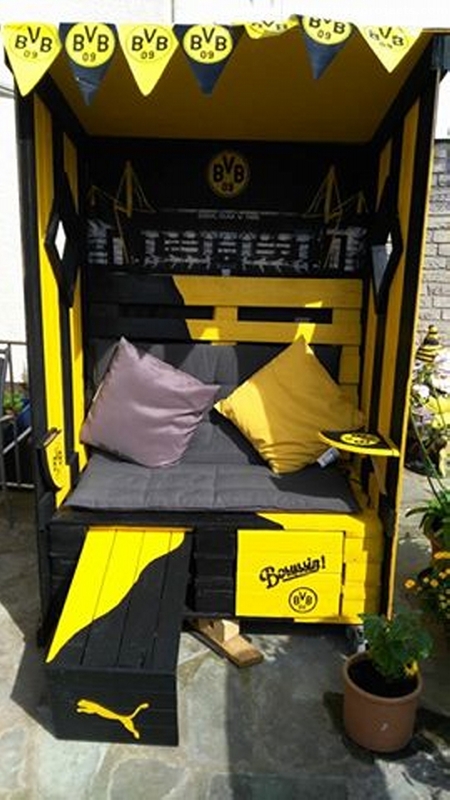 You are not bound to use strandkorb on the beach only as this is basically a mere furniture item, so you can also use it domestically in your patio or even in the garden to make the mark. Look at the next project of the day. 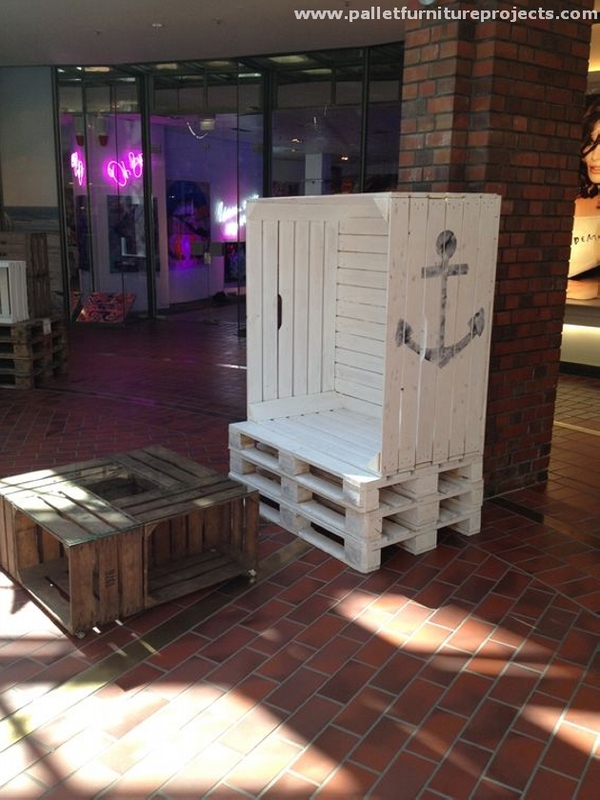 This is probably the simplest strandkorb recycled with raw wooden pallets. If you have had enough of wooden pallet conventional furniture items and you had a craving to do something different, you just can not have a better choice than that. Apparently it seems like a huge box shaped random object made using the pallet planks. But when we ponder upon the design we realize that it is a full fledge strandkorb that could be carried to the beach but here we have created with a different intention. We have made it to be used in domestic area, like it could be used in the patio or garden. If you are having a swimming pool inside your premises, this could be the best installation at that sight. You can switch the conventional long chairs or daybeds with this gigantic strandkorb and save a lot of bucks. Its main structure is the simplest one so far, a number of pallets put one on another, and the upper box shaped cabin made using the pallet planks and finally it is stained as bright white. 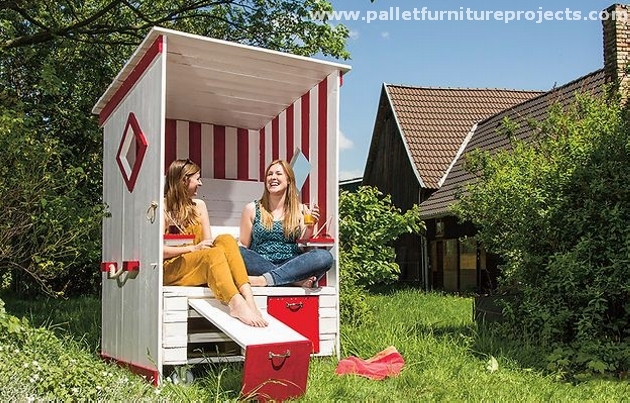 Just to bring about some change in your room interior, this strandkorb could be the best option undoubtedly.